We stock a full line of new and used Aston Martin parts for the classic 6-cylinder DB Aston Martins, DB2, DB3, DB4, DB5 and DB6. We use the Factory Parts Manuals as our catalogue and numbering system. We can supply from our inventory copies of these manuals, as well as Factory Workshop Manuals and Owners Handbooks. 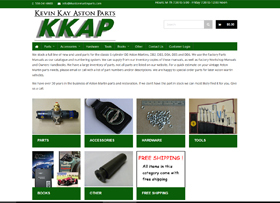 We have a large inventory of parts, not all parts are listed on our website. For a quick estimate on your vintage Aston Martin parts needs, please email or call with a list of part numbers and/or descriptions. We are happy to special order parts for later Aston Martin vehicles. We have over 30 years in the business of Aston Martin parts and restoration. If we don’t have the part in stock we can most likely find it for you. Give us a call.